Junior Ashley Lewis (16) ranks first the GSC in game winning goals. Junior Ashley Lewis is having a legendary season for Lady Blazers’ soccer, and it has lifted the squad to new heights. 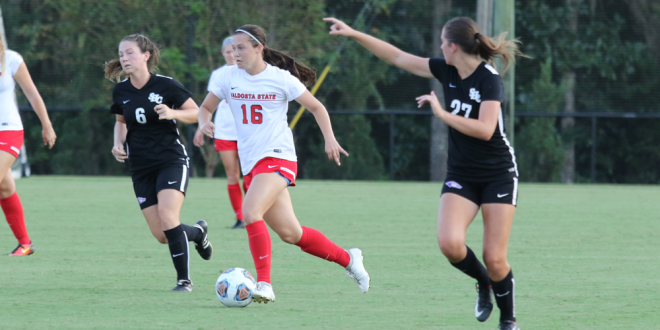 Friday evening, Lewis scored her sixth game winning goal of the season, breaking the Valdosta State single-season goals record and the single-season points record in a 3-1 victory over the winless Union Bulldogs at the VSU Soccer Complex. The Lady Blazers coughed up on a bad clearance, leading to a corner kick for the Bulldogs freshman Tiffany Linser. Linser assisted the corner kick and found Anna Barkey on the back post for a 1-0 lead at the 15:11 mark of the first half of play. Barkey posted four shots with two on goal and the lone goal for Union. The Lady Blazers had ample opportunities at goals, with six shots in first 15 minutes of the game. Senior Suvi Savolainen attempted two during the span, but both sailed high above the target area. Savolainen had five total shots in the matchup. A spurt of luck for the Lady Blazers were made at the 23:23 mark, as a foul on the Bulldogs in the box gave VSU a penalty kick. Sophomore Paige Taylor converted the PK for a 1-1 score, the first goal of her collegiate career. Off a foul just outside the box, Lady Blazer’s freshman Kyleigh Reedy was on the receiving end of the kick and scored with a great header, but an offsides penalty was called on the Lady Blazers with six minutes left in the first half negating the score. Senior Mallory McDaniel had two good looks, one was blocked early in the second half and the other was saved by a field player for the Bulldogs. Union’s Emie Peterson had an opportunity to score in transition, but sophomore Caroline Embler was there to delete potential points. The Lady Blazers had another great look, but it was just another after thought with a save from the Bulldogs. After a corner kick from senior Carley Montgomery, Lewis’ record goal connected with the back of the net at the 53:28 mark for her 12th score of the season. Montgomery notched her sixth assist of the season on the play. The goal broke the single-season point record with Lewis’ 26th point of the season surpassing current Lady Blazer senior Taylor Snell’s record of 24 points in 2017. Minutes following, junior Riley Tennant scored off an assist from Haille Paterson, barely edging the Union goal keeper. The lead grew to 3-1 at the 56:33 mark. The Blazers held a 15-7 lead in shots and 5-4 advantage in shots on goal, while registering six corner kicks to two for the Bulldogs. For the game, the Lady Blazers tallied 28 shots with 12 on frame as Lewis led the way with six shots and two on target and one goal. The Blazers complete the 2018 home regular season schedule Sunday for Senior Day at 1 p.m. 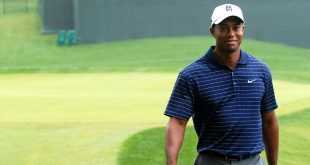 Written by Prince Robinson Jr., Sports Editor. Photo Courtesy of VSU Athletics. For more sports click here.